When you initially begin a new business, you try to manage every aspect on your own. Over time the scale of business expands and as a result it becomes difficult for you to manage entire things on your own. You need to admit that trying to perform every task yourself eventually reduces your business’s productivity. The truth however is that, you cannot just let it go! So a wise solution that is even appreciated by most of the reputed business owners is to hire a manager. Hiring a manager might be a luxury for start-ups but it actually pays in the long run. A manager infuses company culture, can enhance your employee’s productivity, and make your office a good working place. If you are unsure about the perfect time to hire a manager, then here are some signs that indicate when your company needs the support of a manager. At an initial level you fix a working time till 6’o clock in the evening that gradually increases to one hour more either every week or every month. As a result, you start spending more hours in the office to take care of even minute things. You are solely managing each thing ranging from preparing client’s presentations to checking the list for employees off. Spending more hours in the office is a clear indication that it is high time you hire a manager. A responsible manager can look after minute details of your office if not major ones and make you stick to working hours that were initially decided by you. There are numerous lagging signs informing you, it is time to hire a manager who can take responsibility of your day-to-day operations. While the ‘perfect time’ may vary from business to business, the one good time to hire a manager is before your business enters a new phase of growth. Hiring an operations manager would ease your business operations and would facilitate your business growth. If you do not have an appropriate person for a particular task then eventually you handover the responsibility to one of your team members. If your business development team is wasting time in coordinating meetings, fixing conference venues, planning happy hours and ordering lunch then undoubtedly it is time to make a hiring of a manager. A happy team is more successful and even small organizations need a manager who can look after small to major needs of their employees and take dedicated responsibility of all such tasks. When you are not able to clearly focus on your business and plan appropriate strategic development then it is a big sign to hire a manager. Due to lack of proper resources, lack of time and overburdening, you are not able to focus on targeting new opportunities and build relationships with your clients. You, therefore, need to hire a manager who can free you from focusing on strategic relationships and targeting new business clients. Efficiency of the organization is paramount to any business’s success. This is even true for a start-up that cannot afford to waste a single penny. A dedicated office manager can help coordinating the tasks across departments and among team members, so that available resources are utilized in optimum manner. More important than this, such a professional can manage all tasks and ensures that tasks don’t overlap. There would be some stances when you would feel trapped in a vicious wheel and you are spending time on tasks that are not going to pay you and nor need your time and skill set. At such stance, it is time to make a hiring for a manager who can focus on such things and give you time to focus on the big picture. If you are not able to spend enough time on creating new ideas, strategies and things for your business success and are only trying to fix things and work it right for your business, then it calls to hire a manager. Your business can succeed and expand only if you work as a builder. So if you are spending more of your time in spending as a fixer, you must hire a help to carry less vital works on your behalf. If you are not able to manage administrative tasks like productivity reports, payroll, filling systems and more such tasks then it is the right time to hire an office manager. Such official tasks can be managed by a third person and this way you would have ample time to look over other productive works that need to fix as soon as possible. When you are out of time, the quality of work and decisions related to work will suffer. It is because you are not able to completely focus on things and hence tend to make mistake that can even cost your business. To avoid happening of any such situation and to be sure that your business repo does not suffers, you must hire a manager who can look after things and allow you with more time to focus on essential aspects of your business. Probably, you can do a lot of tasks and can perform them relatively well. When things, however, are getting messed up then you need to figure out the best and what someone else could do better. As the head of the company, you must be serving well in managing, leading, matching the big – picture, targeting new clients and more. You may therefore bring on someone who can maintain not just your office decorum but can enhance your business’s day to day operations and other small details related to office employees. Another important sign you need to hire a manager or an external help is when you are repeating tasks. As the founder of your organization, you must do different things each day, from bringing new partnerships to pitching new clients to securing investments. If you are fixed to daily same routine like updating quick books, client management, social media posting or more, then you need to hire someone else who can move those tasks off your table. If you experience a point in your professional life that your business is managing you and it is not the other way round then you need to hire an external help from someone you could delegate the responsibility. The decision can be tough, but as a founder you must understand that less vital functions needs only your supervision and not your precious time. As a head, you must have enough free time to focus on the essentials and fundamentals of the company in order to obtain adequate results. Most of the entrepreneurs believe that they can manage it all and can do all the things. You must hire and recruit people who you can trust and who are interested to enter into the management roles. It is better to promote a manager from within the team rather than hiring from an external source. This way, you would also gain more chances of success and support and ensure that the culture of your company remains strong. Even as a manager you must have enough time to relax and enjoy. Don’t let the high – volume of company’s demands haul over your special time for relaxation and enjoyment. It is essential to have certain slack time to do things that keep you mentally healthy and emotionally fit. If you find that you are not able to track your employees’ performance reports, projects and tasks on a regular basis, it is time to bring in a new manager. It is essential to keep a track record of each employee’s progress and to give attention, time and feedback to the team with whom you are working. Keeping a periodic check is essential and hiring a manager is a way to find enough time for conducting such exercises. When major part of your day is spent on managing each department, then you need to hire a manager who can oversee your employees. Once your company has expanded its scale of operations, there are lot more things to manage rather than just your employees, such as legal matters and expenses. A manager can be an asset to your organization as he could give you direct guidance regarding your office even when you are not there. When you are not able to focus well then definitely you would be missing deadlines, budgets would be going over and you would find that your staff is not doing as much as expected from them. As a leader, you must look after each and every aspect going on in your company. So if you think that your management team is disturbed or disorganized then you must find help of a manager who can look after your team and ensure that your company experiences hassle – free work atmosphere. Definitely you would be giving a fixed stipend to the manager and since such a person would be more responsible so there are chances that you have to offer him a decent amount of salary. So before you take the final decision of hiring a manager for your office, you must be sure that you are in the correct position to afford one. 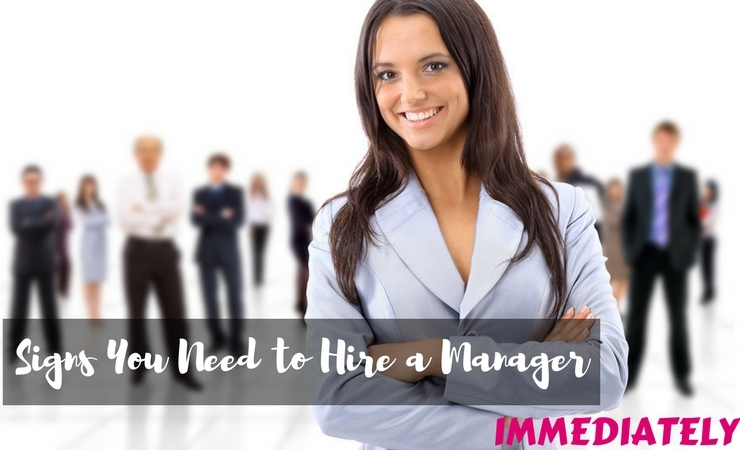 As soon as you are comfortable with hiring a manager, you would be able to manage things pretty well and would be able to grow your business in a way that is otherwise not possible. If your business is in a situation of fixed revenue and you are not able to deliver much time to increase it, then usually there is just one thing that can help you out and that is hiring a manager. A manager can perform day-to-day operations and can even carry vital meetings on your behalf, especially when you are not in town or available at the office. This would lead to less loss of quality clients and hence can help you increase your business revenue to a higher level. Ultimately, a common problem among business owners is increased level of frustration, mainly because of not being able to manage things properly. At one point of time, business owners are not able to devote enough time to core areas of their business that leads to development of frustration within them. So if you too feel that someone is always on your head and think that you need someone to manage your team, then you must hire a manager. A manager would be responsible for delivering answers to their questions and take essential steps required to complete their projects on time. So just list out things that you do it yourself and that are pending and needs to be focused. For major aspects of your business that needs core attention, you need to spend time while for other minor activities related to your office, the best way to manage them is hire a mature, responsible and skillful manager who can manage those tasks on your behalf.